Hortus Camdenensis | Gordonia altamaha Sarg. Deciduous shrub or small tree with toothed oblong leaves and solitary, cup-shaped white flowers, to 8cm across, in late summer. To 9m. [RHSD, Hortus]. ‘Gordonia Altamaha is not now known to grow anywhere naturally. It was discovered by John Bartram in 1765, during one of his journeys through the southern states, near Fort Barrington on the Altamaha River in Georgia, occupying with Pinckneya pubens an area of two or three acres. William Bartram, who had accompanied his father during the journey of 1765, revisited the Altamaha River eight years later, and again in 1778, and collected roots and seeds of the beautiful flowering tree which had so impressed his father and himself that they had thought it worthy of the name of Franklinia, which they proposed for it in honor of their distinguished friend and neighbor, Benjamin Franklin. Dr. Moses Marshall visited the same locality in 1790 and saw Franklinia. 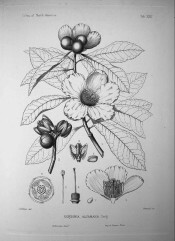 No botanist since 1790, however, has seen the plant growing wild, and all efforts to find it in the original locality or elsewhere have been unsuccessful. 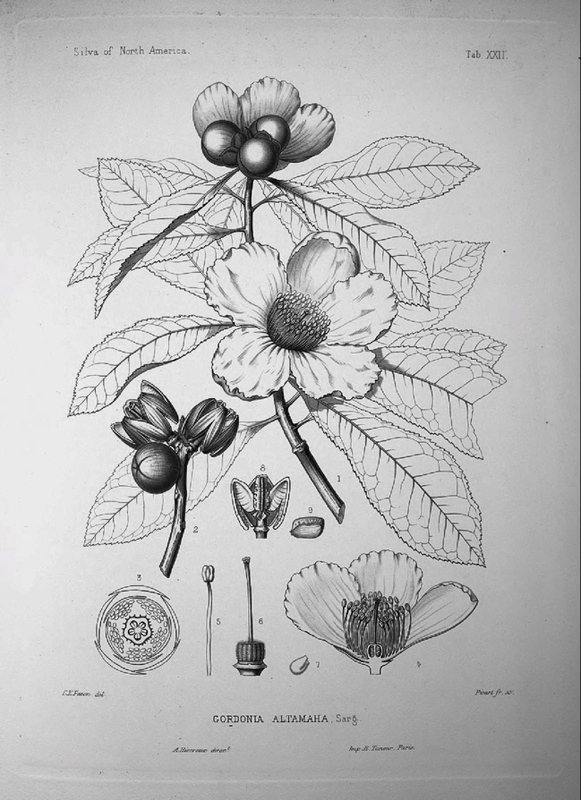 Gordonia Altamaha was introduced into gardens by the Bartrams, and reached England as early as 1774. In cultivation it forms a low spreading shrubby tree, with a short stout trunk covered with smooth dark brown bark. It is hardy in the United States as far north as Philadelphia, and flourishes in England and in central Europe. It grows well in rich light loam near water, and may be propagated by layers.’ [Sargent – Silva of North America vol.1, p.45, pl.XXII/1891]. Desideratum to Loddiges’, 6th January 1845. [MP A2933-2, p.28]. There are no other records and it may not have been grown in the gardens.